Come paddle with us! Since 1999 and continuing today, Hackensack Riverkeeper remains the only operator of canoe/kayak liveries in our watershed. Now fielding a fleet of more than fifty canoes and kayaks, we look forward to giving you, your family & friends opportunities to enjoy and explore the river, the Meadowlands and Overpeck Lake at your own pace or on one of our Laurel Hill moonlight paddles. Please note that our paddling activities are donation-based, as opposed to fee-based and all funds raised help support the ongoing mission of Hackensack Riverkeeper. Wondering if we will be closed due to weather? Join Hackensack Riverkeeper, Inc. text or email alerts. Note: Last boats out 4 hours before closing. Our Paddling Center at Laurel Hill County Park (which also serves as Hackensack Riverkeeper’s field office) is located at the end of New County Road in Secaucus, NJ. It is easily accessible from NJ Turnpike (Eastern Spur) Exit 15X, Route 3 to Meadowlands Parkway, or via NJ Transit buses and trains to Secaucus Junction. The park is located on the east bank of the Hackensack River at the southern end of the New Jersey Meadowlands directly across from the Saw Mill Creek Wildlife Management Area. *The Paddling Center’s season typically runs from the first weekend after Earth Day (April 22) until the last weekend before Halloween (October 31), The center will be OPEN (weather permitting) on Saturdays and Sundays, and on the following Monday holidays: Memorial Day, Independence Day and Labor Day. The center will be CLOSED for EarthFest Overpeck, Reservoir Paddles, and offsite SPLASH events. After a short paddling lesson and river orientation, each paddler will be provided with a whistle, paddle and laminated map and US Coast Guard-approved Personal Flotation Device (PFD). Paddlers MUST wear their PFDs at all times while on the water. Be sure to bring water, sunscreen, insect repellent and a charged cellphone. Consider bringing a hat, sunglasses, binoculars, camera, field guide, snacks and anything else that will make your on-water time more enjoyable. Carry your gear in a waterproof bag. You must have two paddlers per canoe. At least one (preferably experienced) paddler must be a legal adult. Teens 16 and older may substitute for the 2nd adult paddler. Up to three adults, or two adults with one or two children is a comfortable fit. You must have at least one (preferably experienced) legal adult paddler per kayak. Teens may paddle in a tandem kayak if the other paddler is an experienced legal adult. NO solo paddling is permitted, so if you want to paddle a single kayak, bring a buddy for a second boat. Moonlight Paddles are a great way to explore and experience the real Meadowlands. Enjoy a leisurely, two-hour paddle through the marshes of the Sawmill Creek Wildlife Management Area with an experienced guide. See the full schedule of this year’s Moonlight Paddles. Reservations are required for all Moonlight Paddles; program donations are taken ONSITE via cash, check or credit card. Moonlight paddles are ADULTS ONLY events. To make reservations or to get more information, please contact our Program Director Hugh Carola at 201-968-0808. Upon reserving, your trip confirmation and directions will be mailed (or e-mailed) to you. We use the buddy system – SOLO PADDLING IS NOT PERMITTED. Alcoholic beverages and illegal drugs are NOT PERMITTED in our boats or in the park. All paddlers must be 16 years or older. All boats must have one legal adult (18+ years of age) aboard. Up to three adults, or two adults with one or two children are permitted in canoes. No canoe passengers under age 7 are allowed. Note: ALL “Mooners” take place on easy-to-paddle Incoming tides. Note: Last boats out 2 hours before closing. CALL 201-968-0808 for the current current schedule or check our Facebook page. Donation: $15.00 per paddler for UP TO two hours / $10.00 per paddler each additional hour; $25.00 per standup paddle board for two hours.The calm, non-tidal waters of Overpeck Lake are perfect for novice paddlers and paddlers with children. Our Overpeck Park Kayak Center is most easily accessible via the park entrance at 50 Fort Lee Road, Leonia. Enter the park at the light and turn right at the traffic circle. After crossing over two wooden bridges, you will see the center and parking lot on your left. The park can also be reached by NJ Transit buses. *The Kayak Center’s season typically runs from the first weekend after Earth Day (April 22) until the last weekend before Halloween (October 31). The center will be OPEN (weather permitting) on the standard dates/time of operation, and will also be OPEN on the following Monday holidays from 9AM to 6PM: Memorial Day, Independence Day and Labor Day. The center will be CLOSED for our Reservoir Challenge event, which takes place in early June. Reservations are required for groups of 8 or more. Boats are always subject to availability. After a short paddling lesson and orientation, each paddler will be provided with a whistle, paddle, and US Coast Guard-approved Personal Flotation Device (PFD). All paddlers MUST wear their PFD at all times while on the water. 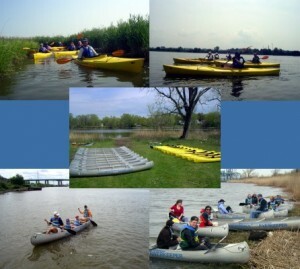 Private group paddling events can be arranged to take place at Overpeck. Contact Program Manager Russ Wilke at 201-477-8127 or paddling@hackensackriverkeeper.org for info. Children 5 to 8 can ride as a passenger in a canoe with TWO adult paddlers. Children 9-11 can paddle in a tandem kayak with one adult in the rear. Children 12 & up can paddle a single kayak, but must be accompanied on the water by a parent or guardian over 18 at all times.